From the overlook, Cliff Palace looks like an elaborate sand castle, painstakingly sculpted under the protection of the cliffs. It’s only the line of people walking through on a ranger-guided tour that give scale to the 4-storied, 150-room complex. This was my first glimpse of the Anasazi cliff dwellings, and it was more happenstance than plan. I was working as a tour guide at the time, and Mesa Verde National Park happened to be on the itinerary. Despite diligently doing my research, and preparing a brief spiel about the Anasazi for the passengers to ignore, and learning the answers to the sort of in-depth, insightful questions that a tour guide typically gets—Where are the bathrooms? What’s this place called again? 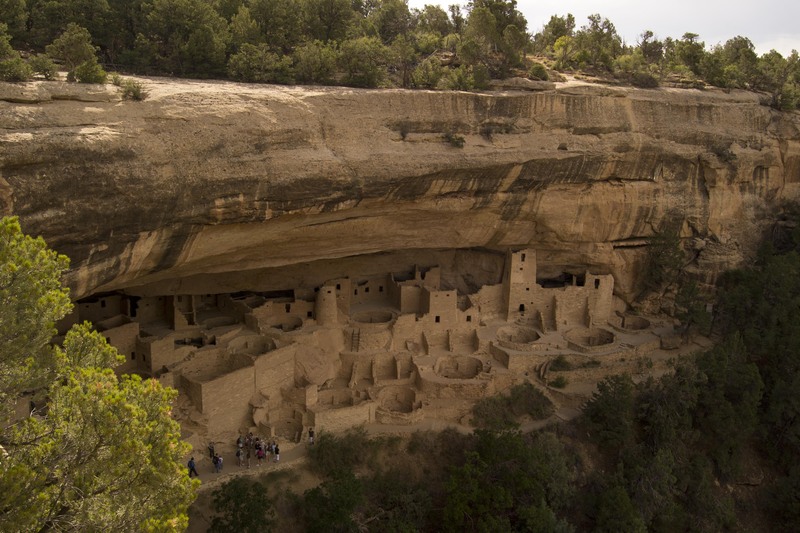 Do they have Wifi?–despite thinking that I had some idea what to expect, the magnitude of the dwellings, and the scale and scope of the civilization that had built them, left me awed, intrigued, itching to find out more about the Anasazi than a few hours at Mesa Verde could answer. The Anasazi weren’t the only culture to have inhabited the Southwest, of course. There were the Hohokam, highly skilled irrigators living south and west of the Anasazi. And there were the Mogollon, who developed agriculture and certain cultural elements long before their neighbors, and whose culture was picked up , built upon, and ultimately overshadowed and absorbed by the Anasazi. And there was the Fremont culture to the north, who disappeared with even less trace than the Anasazi. But somehow, of all the cultures to inhabit the southwest region, the Anasazi, the “Ancient Ones,” have left the most visible marks, not only on the landscape or the Four Corners, but also in the imagination. This was a civilization that spanned nearly 1300 years, and stretched hundreds of miles across the Four Corners region. It was a civilization that built some of the most stunning ancient cities in North America, and that developed an elaborate network of trade and roads. One of the earliest artifacts found in the region where the Anasazi made their home was a Clovis Point, noticed by a rancher, and left untouched out of fear that people would disturb it and put it in the dusty innards of some museum, never again to see the light of day. Currently on display at the Anasazi State Park in Boulder, UT, the Clovis Point dates back to 10,000BC, when the earliest known inhabitants of this area, the Paleo Indians, hunted mammoths and big game throughout the region. When the big game went extinct, the culture shifted to relying more on plants for food, and eventually began incorporating corn into their diets. This shift marked the start of what is called the Desert culture, or Chochise. Out of this Desert Culture, the distinctive elements of Anasazi culture emerged, around AD 1. They were nomadic, cave dwelling hunters who occasionally dabbled in agriculture. They rarely built permanent dwellings, and one of the few lingering traces of this time period is the cists that they built in caves; these dug-out storage areas were used to stockpile seeds, tools, and other various things, storing them up for when they may pass by again. The baskets that they made during this period were distinctive, and earned them the name “Basketmaker Anasazi.” Using plant fibers, they created tightly woven, coiled baskets, strong enough to carry water and cook in. Around AD 500, influenced by the Hohokam and Mogollon cultures to the south, the Anasazi began a period of immense change and growth. The bow and arrow replaced their atlatl-propelled spears for hunting, and agriculture expanded to include beans, corn, and squash, leading to a less nomadic existence. They began to live in underground dwellings called pit houses. Although they still lived in small family groups, these groups began to cluster together in a few places, creating larger villages. It was also around this time that the Anasazi began to replace their baskets with pottery, most likely influenced by their Mogollon and Hohokam neighbors. By AD 750, the Anasazi had not only caught up to their neighbors, they were surpassing them. AD 750 saw the emergence of above-ground homes, which came to be called pueblos. The pit houses didn’t disappear entirely. Instead, they transformed from living spaces to great underground ceremonial structures called kivas. The Hopi, descendants of the Anasazi, believe that during the time of creation, the chosen people were led by the Gods to the surface of the Earth through a hole in the Third World, called a sipapu. Entrance to their kivas, like those of the Anasazi’s kivas, is through a hole on the top, so that anyone entering or exiting is be reminded of this myth and of the people’s journey to this world, the Fourth World. Descending into the reconstructed Great Kiva at the ruins in Aztec, New Mexico, there is a strong sense of descending out of one world, and into the past. Light pours in through the sipapu, the entryway into the Fourth World, and the neatly plastered walls hold a quiet reverence. 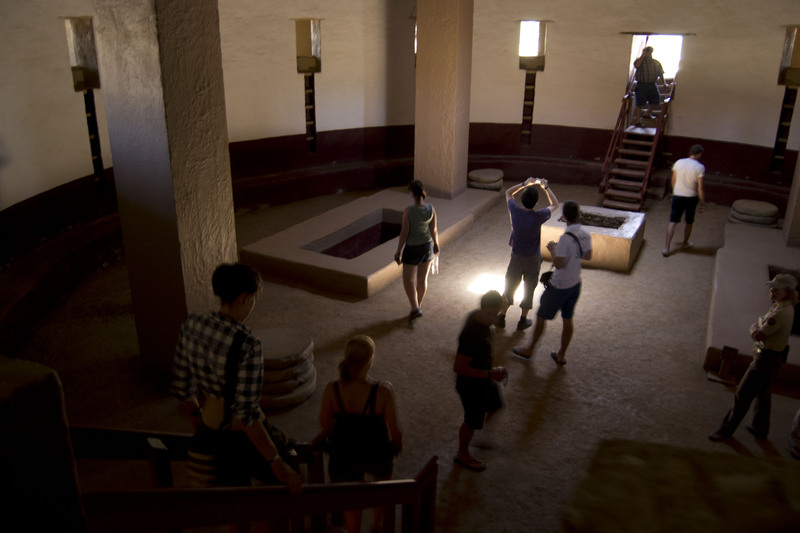 At the height of Anasazi civilization, great ceremonies and religious rites would have been conducted in the cool, sacred space of kivas nearly identical to this one. The city at Aztec was built around 1100AD, before the Anasazi had to seek the safety and shelter of the cliff dwellings for which they are so well-known. It was built in the open, with an expansive desert stretching around it on all sides. By this time, the Anasazi had had developed some of the most elaborate methods of stone work and masonry, as well as turning their pottery into a highly developed art. The cool, sacred space of the kiva seems timeless and removed from the world above. You can almost believe that you’ll step back out into an ancient world and find a bustling civilization, masters of the land, confident and sure. I find myself wondering what the sounds of life would have been like in the blistering heat up above—work being done on the rooftops, games played in the plaza, construction and expansion of the city, trade passing through. This complex outside of the town of Aztec, New Mexico, was a satellite settlement to the much larger Chaco Canyon urban centers to the south. 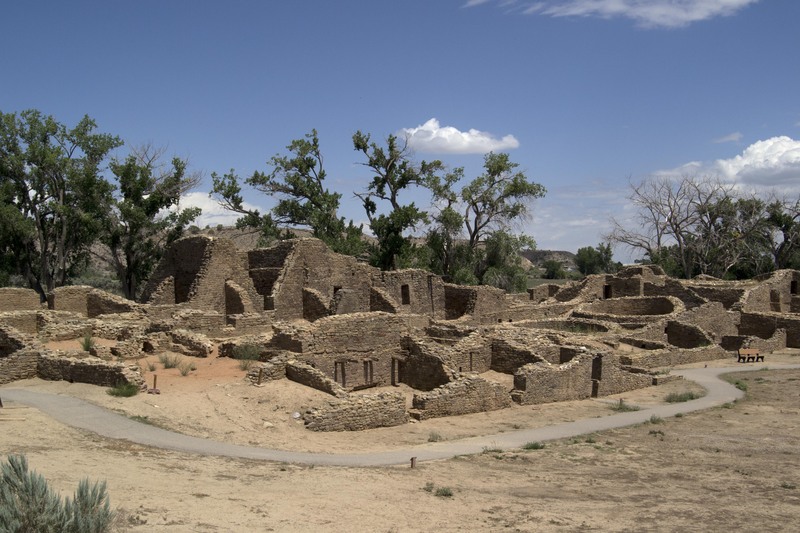 Although Aztec’s ruins might have the grandeur of a great civilization in itself, it was in fact only one of the outlying settlements on the road from Chaco Canyon, 70 miles to the south. It was the cities in Chaco that developed first, and that grew into the most extensive and elaborate trading centers and urban centers. Chaco was also a center of agriculture, developing well-honed irrigation systems. In Chaco Canyon, the Anasazi built twelve great cities, the largest of which was Pueblo Bonita. 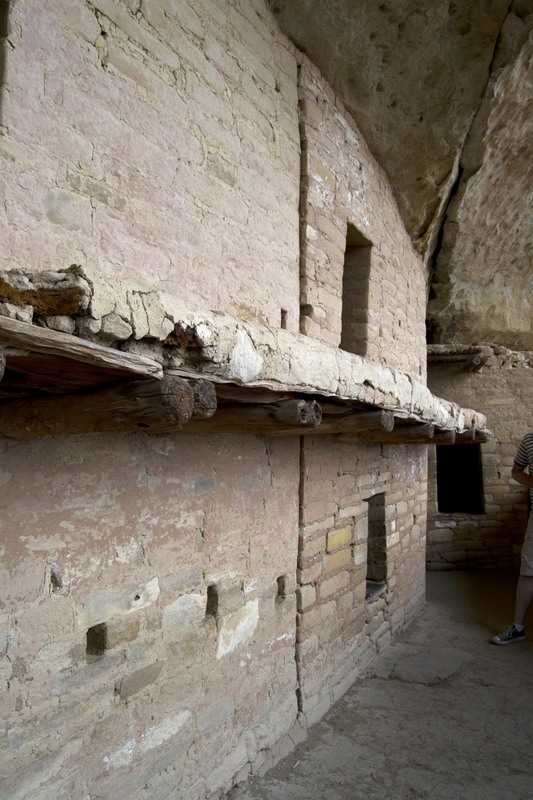 Spanning 3 acres, with over eight hundred inter-connected rooms, and housing over 1,000 people, Pueblo Bonita exemplifies the careful planning, refined building techniques, and social organization that characterized Anasazi civilization at its height. Chaco was the first population center to develop to its height, and the other main regions of Anasazi population, Kayenta to the west, and Mesa Verde to the north, soon followed. Each region had its own distinct culture, building styles, and forms of artistic expression. And each region, in their turn, abandoned their homes and began a slow migration south. The original inhabitants of Aztec left in the late 1200s. Mesa Verdeans, on their own route southward, took up temporary residence in the ruins at Aztec. By the early 1300s, Aztec, as well as most other Anasazi civilization, stood empty. That meaning echoes in my head as I drive my tour van through the desolate, burnt remnants of a forest in Mesa Verde National Park, climbing higher and higher up a road so steep and windy that, even with the trailer dropped at a parking lot, the van struggles. The mountains stand tall and rugged, and for miles and miles, barren and blackened trees stretch upward. When we reach the Balcony House parking lot, John, a white-haired, fatherly park ranger warns us that visiting Balcony House is not for anyone with a fear of heights. He leads us down a steep path to a small alcove in the sandstone cliffs that a few Anasazi families had turned into their home. 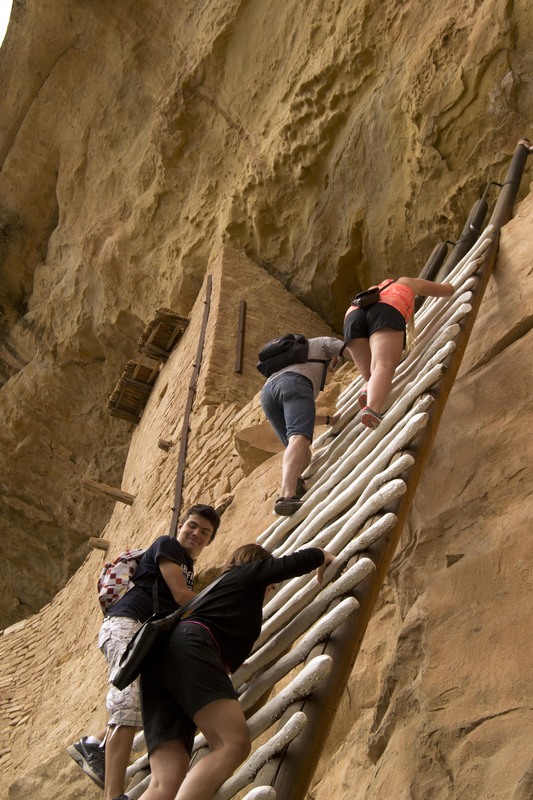 In lieu of using the original Anasazi routes up and down, the National Park Service put in this ladder for Balcony House tours. What must have led the Anasazi to abandon homes that they had spent centuries creating? What drove them into these death-defying, defensive cliff fortresses, if that’s what they are? The reasons for the Anasazi’s disappearance are still a cause for debate. Some cite the droughts in the region, revealed by tree ring records. Others suggest that the Anasazi may have been victims of their own success, suggesting that the land may not have been able to support the numbers that crowded to the urban centers. Still others point out the defensive components that appear in later Anasazi structures. Doors where there was a never need for them before, walled complexes, even the move to the more defensible cliff-dwellings, could indicate that attacks from rival cultures drove them out, or that as resources dwindled, warfare erupted among the Anasazi. It’s likely a combination of all of those factors. And it’s likely we’ll never know the exact answer. An example of the Anasazi’s building skills. The current Pueblo cultures of the southwest—the Hopi, Zuni, and Acoma, among others—have a strong sense continuity with Anasazi culture, architecture, religion, and art. 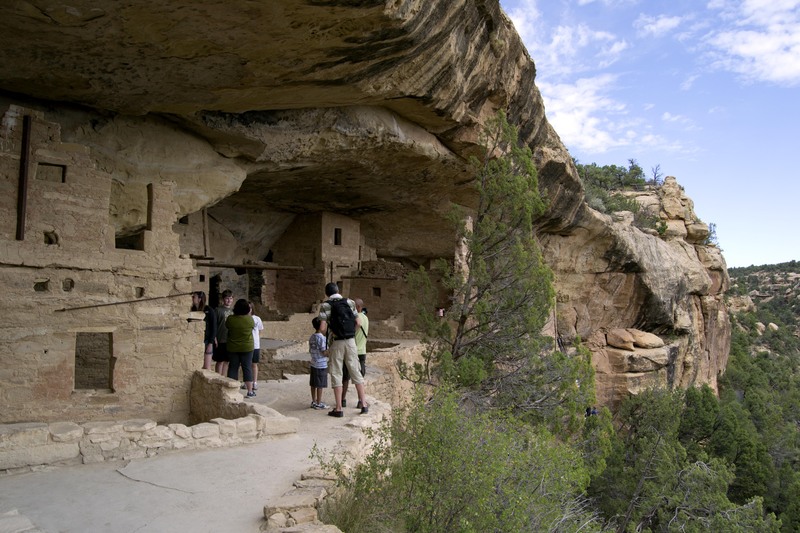 The share many of the building styles of the Anasazi, and continue to hold important religious ceremonies in kivas. Some elements of the Anasazi culture survive and thrive. But the sprawling city-complexes, the elaborate trade networks and roads, the intricacies of their society, and the mystery of why they abandoned everything to migrate southward—these are all left to archaeologists, historians, and the imagination. I’m inclined to feel a sense of tragedy and loss in it all. But I remember another story: in Balcony House, there is a carefully crafted bit of wall that is gradually giving way to the forces of erosion. The NPS is trying to preserve it. The modern Puebloans say to let it go to dust. Whoever built it would have understood what the Puebloans of today understand: all things have their time, and all things disappear in the end.